Our Sunday services are at 8:00 and 10:30 am, from the second Sunday after Labor Day through the first Sunday in June. During the summer months (the second Sunday in June through the first Sunday after Labor Day) we gather for one service at 9:00 am. Our 8:00 service is quiet, small, and reflective, using traditional language (Rite I) and offering a full sermon as well as the celebration of the Holy Eucharist. Our 10:30 service is often much larger, featuring hymns and choral anthems led by our adult and/or youth choirs, using contemporary language (Rite II), and also offering a full sermon as well as the celebration of the Holy Eucharist. Our 9:00 summer service is usually a lovely combination of the two! 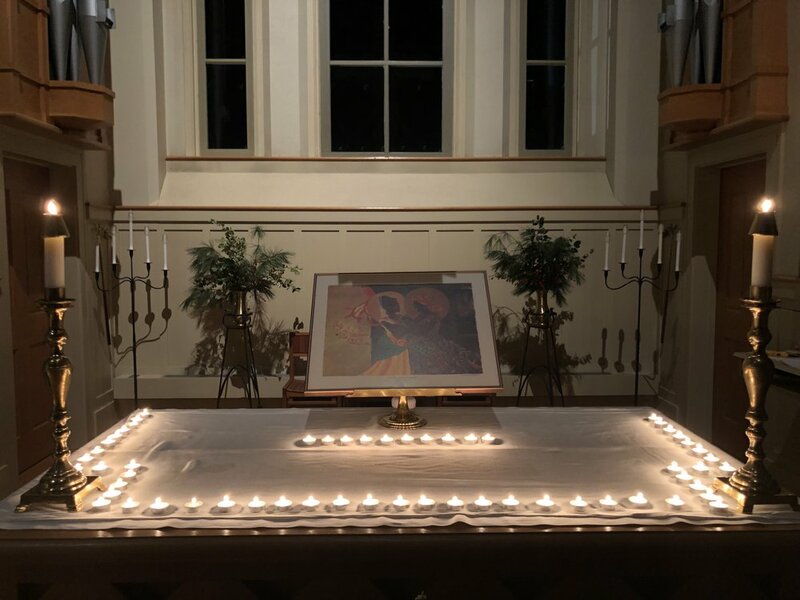 Starting February 3, 2019 and continuing the First Sunday of each month, we will offer a Taize worship service at 7:00 pm. Our second core value calls us to a ministry of worship and prayer. In its liturgical life, All Saints’ Church invites all to join together in acknowledging the holiness and unconditional love of God, hearing God's Word, offering prayer, and celebrating the sacraments. In a spirit of openness to God and with each other, we appreciate and explore a variety of ways to gather in community. We value music as an integral path to God. We are deeply committed to making sustaining connections between worship and everyday life, so that those who gather around the altar find solace and strength, pardon and renewal. Our worship is supported by the work of many lay ministers. Adults, teens, and children serve as readers, ushers, acolytes, and oblation bearers, as members of the choir, contemporary music group and children’s choir, as altar guild and flower guild members, as Eucharistic ministers and healing ministers, as hosts for coffee hour and other special receptions. Vibrant, God-centered worship inspires and sustains ordained and lay ministers and brings more volunteers into these rewarding and essential positions. We endeavor to offer and celebrate Christ-centered worship so that seekers experience welcome and all are nourished as we stand in the presence of the living God for the life of the world. This worship, owned and participated in by all at different levels, embraces a range of expression from the intimate to the transcendent.